Kids Weather Facts - Exploring climate. 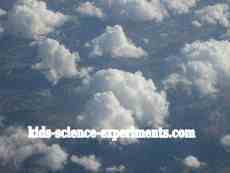 ~ Clouds are made up of millions of tiny water droplets or ice crystals suspended in the air. They are named according to their shape and height. Listed below are some interesting and fascinating facts about our weather here on our planet, Earth. Weather Watchers - be sure to always take safety, shelter and provisions if you ever observe a storm!!! All the snow and rain that falls to the earth flows off in rivers or glaciers or soaks into the ground. Eventually all this water reaches the sea and is then evaporated to form clouds which then rain falls back onto the Earth. An avalanche is a mass of snow which comes loose from a mountain and hurtles down a steep slope towards the area below. Icebergs are large lumps of ice which have broken away from ice sheets and glaciers that drift into the sea. A typhoon is a mature tropical cyclone that develops in the western part of the North Pacific Ocean. Hurricanes, cyclones and typhoons are all tropical storms, and are the same weather phenomenon but are called different name in different parts of the world. When these storms reach populated area they usually bring very strong winds and rains which can cause a lot of damage. Typhoon is the name given to storms that occur in the Western Pacific. Hurricane is the name give to these type of storms that occur in the Atlantic Ocean and eastern Pacific. In the Indian Ocean they are called tropical cyclones. They are a large storm system having a circular or spiral system of violet winds. The winds spiral around a region of low atmospheric pressure. These stronger storms have an eye which is the centre. An eye s formed when the maximum wind sped reaches 85 mph. The eye is the region of clear air with no clouds. The energy that powers these storms comes from the evaporation of warm ocean water. The water vapours rises to the top of the typhoon along the sides of the eye, then condenses into clouds. Warmer ocean water produces more powerful typhoons, which can grow into super typhoons. If the right conditions persist long enough, they can combine to produce violent winds, torrential rains, incredible waves and floods. Depending on where a tropical storms originates in the world once the wind speed reaches maximum sustained winds of 74 mph the storms are them classified as a cyclone, typhoon or hurricane.